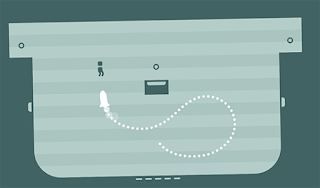 See Saw is a fast platform puzzle game with simple controls. After a few seconds, the player understands the game. From then on, the skill level rises, through new items and harder levels. The game is optimised for mobile and is intended to be as well controllable as console platform game (Super Meat Boy, VVVVVV, N++), this is why the character can’t jump. Instead, trampolines are spread over the levels, making it possible to perform fast and precise jumps. Where other games end, see/saw begins. In this challenging platformer, you sacrifice yourself to get all coins and die through more than 150 levels. Normal platformers need 3 buttons: Left, Right, Jump. I wanted to create a perfectly controllable mobile platformer, so I had to strip one of those away. You don’t control the character, you tilt the world and the character runs where it goes down. This goes along with the story of video game characters not having the choice about their own lives. see/saw is a fast platformer with simple controls. After a few seconds, the player understands the game. From then on, the skill level rises, through new items and harder levels. Each level can be completed in under 15 seconds. The game is optimised for mobile and is intended to be as well controllable as console platformers (Super Meat Boy, VVVVVV, N++), this is why the character can’t jump. Instead, trampolines are spread over the levels, making it possible to perform fast and precise jumps. The game is about the protagonist not having the choice to live or to die. It ends with the character entering a room, where he puts on glasses and turns out to be the evil professor from the beginning. The clue is that you can still collect coins when you are dead – what makes dying a puzzle element in the game.